During this trip to the Bay area, I managed to make it to Britex! I had been there one time many years ago, but I saw it with new eyes now that I have more sewing experience under my belt. I think Nancy described the 4 floors of Britex perfectly, so I refer you to her blog for the details. Can you believe I didn't buy a single thing? I figured I'd get a nice cotton for a spring blouse, but I was feeling miserly that day and left empty-handed. I inquired about that oh-so-elusive fabric, silk jersey. They are located on the 1st floor, and the saleswoman pointed to some way high up shelves to show me their selection. They have some solid colors and a few prints, I squinted and saw a few potentially interesting designs. She said the prices start at $60 - $70/yard and go up from there. I didn't ask her to pull anything down for me. I have heard all about Btitex, even all they way here in Australia.Four floors of fabric and trimmings/buttons sounds like a dream. But I know that when you are travelling it can all a bit overwhelming and if you're not feeling the best, it doesn't help. I can totally relate, for me, its all in the experience, I don't even have to buy anything,, no pressure, I see you got some photos, that is good! Britex! 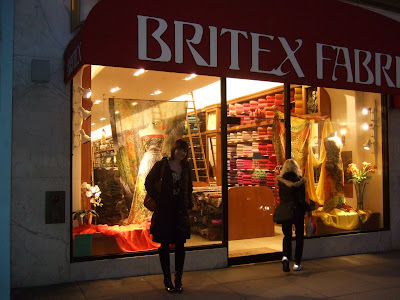 Britex is the first fabric store I ever visited - ever. I started sewing when I lived in the US (I taught for a year in NC) and we went to San Francisco over Spring Break. This is where I bought fabric for my very first garment, and my first pattern (which I used for my wedding - to make the bolero). Even now when I say "Britex!" to Seb, he still smiles. I told him no later than last weekend. And no, I can totally not believe that you didn't buy anything. I went to Britex once with my mom when I must have been in the 7th grade or so. We had such a fun time! And, I got my first piece of wool there -- a traditional blue and green tartan plaid that I made a kilt skirt with. I'd love to go back! I went to Britex once last year and as a newbie I felt completely overwhelmed. I'd love to go back now with a little more experience. It sorta reminds me of Mood in NYC! Looks like you had a great time! I bought the plaid wool for my last jacket at Britex....on a sale table...and it was still the most expensive fabric I ever bought. Nothing?!! Not even from the button wall??!! I still dream and lust after that floor that had the wall of buttons. Do they still have that? They have the same thing at GStreet fabrics in DC. Both of these stores are far, far away from where I live. Maybe that is why I lust after them so. That, my dear, is why I love the 4th floor! Remnants for 30% off the original price! You didn't buy anything??? That is a lot of restraint. Sounds like you had a fun trip though. :-) I ended up making it to Stonemountain last Saturday, but I was not as good as you. A plum wool jersey, fuschia/green rayon knit print, and some cotton batiste followed me home. OK so that's a place I'll have to visit if I ever go to the bay area. The prices though are a bit jaw dropping, no? I've spent lots of time at Britex over the years, and I could see how it could be overwhelming - I don't think I bought anything there the first time I went, either. The best floor, when you're feeling miserly, is the remnants floor (they often have silk jersey there, too) and I always saw fabric I hadn't seen perusing the rest of the store.